Click the button below to add the Partners Card 2018 PC18-208655 to your wish list. AFTER PURCHASE OF PARTNERS CARD, CALL 1-800-869-8116 TO RECEIVE YOUR COUPON CODE AND SAVE 20% OFF YOUR ENTIRE IN-STORE OR ONLINE PURCHASE . 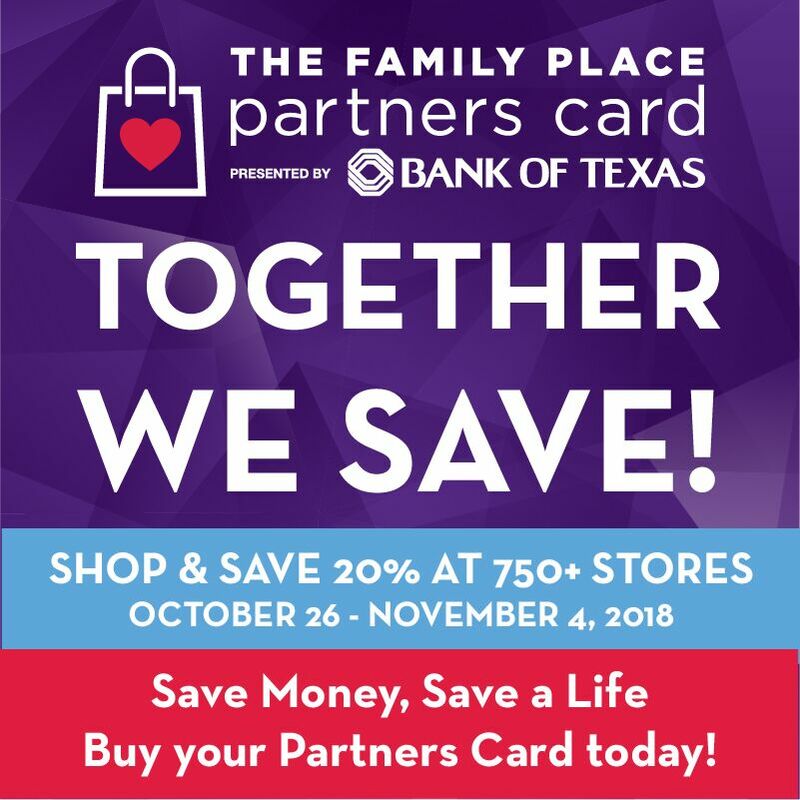 Partners Card is the signature fundraiser for The Family Place, the largest family violence agency in Texas, and a premier charity shopping event in DFW. Partners Card has raised over $18 million to help break the cycle of family violence in our community. 100% of your Partners Card purchase goes directly to supporting survivors of family violence and the services of The Family Place. Your $70 Partners Card pays for 1 night of safety for a victim of family violence at The Family Place shelters. Partners Card 2018 marks its 25th anniversary. Partners Card 2017, presented by Bank of Texas, is the only sale where you truly save. That is, save lives and support the critical work of The Family Place. Purchase a Partners Card for $70. Partners Card entitles the cardholder to a 20% discount at participating retailers for a ten-day period from October 26, 2018 - November 4, 2018. There are more than 750 retailers that participate in the program each year. The "Card" is on the back of an easy-to-use directory with a detailed listing of all participating retailers by area, category and alphabetically. Partners Card is non-transferable and cannot be used by anyone other than the purchaser. Card bearer is required to present signed card to the retailer at the time of purchase. Please keep the card in safe place. Lost card can not be re-issued. Partners Card is not valid with any other offer. Purchase a Partners Card for $70 at Neha's China & Crystal located at 635 W. Campbell Road #234, Richardson, TX 75080 or at our website www.nehaschina.com. Receive Partners Card booklet with the "Card" in mail or pick up the "Card" at Neha's China & Crystal located at 635 W. Campbell Road, #234, Richardson, TX 75080. Start using Partners Card on October 26, 2018 at Neha's China & Crystal, in-store and online at www.nehaschina.com. Receive 20% off on all purchases including Special Orders and items that are already on sale. A Partners Card purchased at Neha's China & Crystal (in-store or online) will receive a coupon code. Use this coupon code at www.nehaschina.com and receive 20% off on all purchases except Sterling Silver. A Partners Card not purchased at Neha's China & Crystal will be verified authenticating the ownership of the Partners Card. To do so, we request an image of the Partners Card duly signed by the owner of the card, name and telephone number emailed to contact@nehaschina.com or faxed at 972-783-7535. Upon authentication, a coupon code will be issued to the customer that may be used at www.nehaschina.com at any time during the entire ten-day period starting October 27, 2017. Request items not on our website: If you are looking for an item that is not on our website, please call or send an email. We will add the product(s) to our website so that you could view and shop the product with your Partners Card from your computer or mobile phone. Out of town and Out of State customers may use Partners Card. Partners Card Discount: 20% Discount is automatically calculated as soon as your exclusive Coupon Code is added at check-out. Special Orders: Partners Card discount is not limited to in-stock items only. All Special Orders placed during this period receive 20% Off the entire purchase. Sale Items: Products that are already on sale receive additional 20% discount on the sale price. 24/7 online use of Partners Card and process your orders from anywhere on the web. No Sales Tax on all orders shipped out of the State of Texas. Free Shipping on all orders over $99. (We ship by UPS. No P.O. Box please. Free shipping not applicable for Alaska and Hawaii.) A tracking number for all shipments is sent to you for your convenience. Free Gift Wrap on all items including your special message to the recipient. Purchase the card online at www.nehaschina.com, start shopping and enjoy the benefits of Partners Card as well as Neha's China and Crystal. Partners Card may be used by placing your order by phone at 1-800-869-8116. 1993 - The Family Place launched Partners Card with 175 participating stores. Ms. Gene Jones served as the first Honorary Chair. Sally Hoglund and Sally Johnson founded the inaugural event which raised $90,000. 1998 - Partners Card revenue exceeded half a million dollars with more than 10,000 cards sold. 2000 - Partners Card grew to more than 500 participating stores. 2007 - Partners Card celebrated 15 years of success, raising $905,000 to help battered women, children and men. 2010 - For the first time, Partners Card raised more than $1 million. The Family Place opens its school facility for K-2nd grade students at our Safe Campus. 2017 - Partners Card celebrated 25 years of shopping with purpose! Partners Card Mobile App and E-Commerce are successfully launched to propel Partners Card into the future of technology. Partners Card raised over $1 million and provided more than 14,000 nights of shelter for victims of family violence.